I offer presentations perfect for company meetings, organizational retreats, conferences, special events, churches, and any occasion calling for a key-note speaker. It is an entertaining, emotionally inspiring, motivating, engagingly interactive & comical story of perseverance, persistence & fortitude along the road less traveled while building one of the nation’s biggest mascot brands and a world wide entertainer. Success happened by passionately focusing on creating memorable & remarkable moments one laugh at a time. 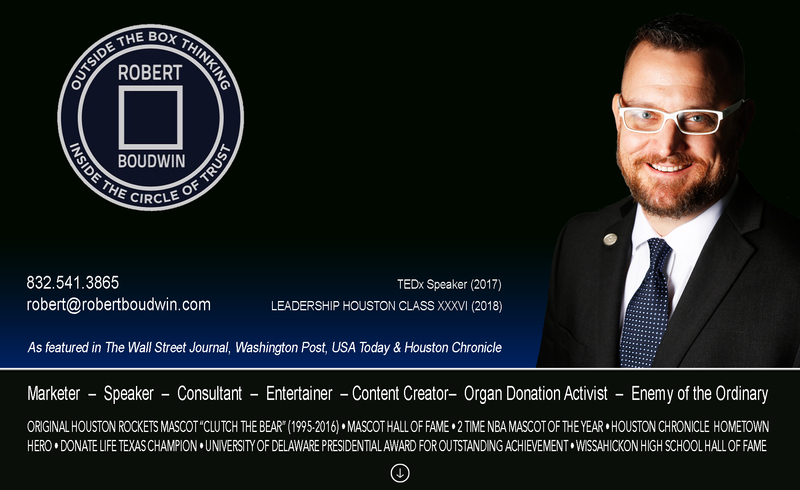 This happened against all odds at the beginning, middle & end of the mascot journey by never giving up and truly over delivering to the customer at every opportunity turning them into a valuable volunteer sales force driving appearance revenues to 4 times that of the average professional mascot & 50 times that from year one to peek. Your employees or members will be left entertained & motivated to achieve their personal best by focusing on how to create special moments for costumers in turn transforming those customers into raving fans! NCAA, Exxon, Baker Botts, Deliotte & Touche, Professional Sports Partners, The Sam Houston Race Park, Williams, Anadarko, Memorial Hermann Hospital, Methodist Hospital, The Clifford Group, Chick-Fil-A, Taste of Texas Restaurant, Menchies, Rice University, Houston Area Chamber of Commerce, United Way of Greater Houston, Houston Rotary Clubs, Life Gift, Nora’s Home & The American Diabetes Association. -Michael Burch, Sr. Vice President, National Sales and Marketing, Speedway Motorsports, Inc. Clips from several presentations can be seen on my web site at robertboudwin.com. Please call or email me to schedule.